It turns out that the Super Bowl-winning football scored by James White wasn’t lost after all. According to ESPN’s Mike Reiss, a team spokesman said that an equipment assistant picked it up at the end of the game, and that it is “normal protocol” for that to happen. White is surely relieved to know that it is now in good hands and on display at the Patriots Hall of Fame. 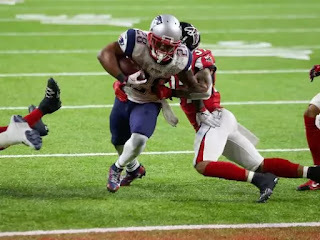 The ball represents the biggest comeback in Super Bowl history in which the New England Patriots came back from a 28-3 deficit to defeat the Atlanta Falcons 34-28. White had an incredible showing in that game in which he broke the Super Bowl record for most individual points scored (20) and most passes caught (14). According to Reiss, the ball could ultimately belong to White in the future, but for now it is being shared for the fans to enjoy.